MVL does not stand alone today. We are built on the families and supporters of the last 40 years. We are also built for the families and supporters yet to come. Above all, our foundation and future is centered on Christ alone. 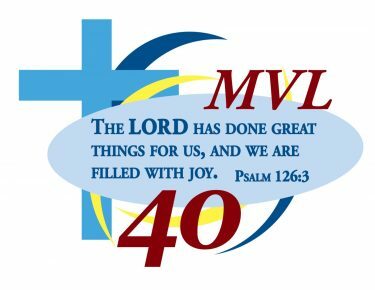 The 2018-19 school year marks MVL’s 40th anniversary. Indeed, “The LORD has done great things for us, and we are filled with joy” (Psalm 126:3). This verse is our school year theme. It is a wonderful reminder of how our loving Lord has provided for us and continues to bless us. Because this is a special time for the entire MVL family, two particularly special things will be happening this year. First, we invite you to be part of $40 for 40. Our goal is to raise $40,000 throughout the school year for the MVL Partnership Fund. The image to the right marks our progress. Thanks to the generosity of so many members of our MVL family, we’ve reached $40,000! Nevertheless, you can still join in this partnership and help make our blessings overflow by donating online or sending in a gift. $40 or $400, every gift impacts students today, yet will bear fruit and multiply for years to come. This is also a wonderful time to honor or remember a classmate, teacher, family member, or student. Second, rather than one large celebration, we are recognizing the 40th anniversary throughout the year. We hope you will be able to visit campus and participate in events as your schedule allows. 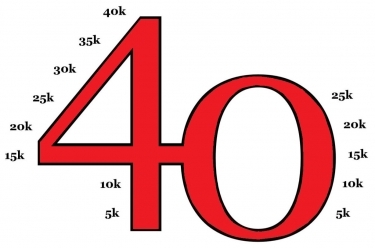 Ruby red is the traditional color for a 40th anniversary. Therefore, keep an eye out for this color at our events and activities! Another opportunity exists for our almost 2,000 alumni! Principal Tim Plath is gathering names for alumni reunion music ensembles throughout the year. This includes a Homecoming Pep Band and choir to sing the national anthem. Register your name, voice part or instrument, and level of interest by emailing Kristin Matzke. Additionally, B.Stark & Co has helped us create an awesome t-shirt (which is made of soft, pre-shrunk material) with our theme for the year from Psalm 126:3. Download an order form or email Kristin with your request. These shirts will be sold throughout the year, as our supply allows! The adult style has the 40th logo on the front left corner with “The Lord has done great things for us” on the back. 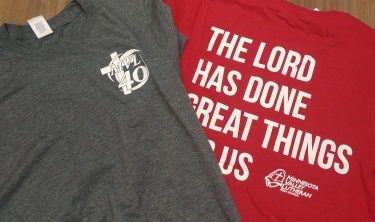 In a complementary style, the youth shirt has the 40th logo centered in the front with “Filled with joy” on the back. $10 for adult (sizes S-3XL). $7 for youth (sizes S-XL). Shipping is an additional $5. Color options are heather red or heather gray.